Bruce played the song 63 times. It was not released on the album" the Seeger Sessions" but it was a steady song during the Seeger Sessions Tour. The songs was released on the Live In Dublin album and home video. At the end of the Seeger Sessions Tour, the three-night stand at Point Theater in Dublin, Ireland, (17-18-19 Nov 2006) was filmed with nine High Definition cameras. 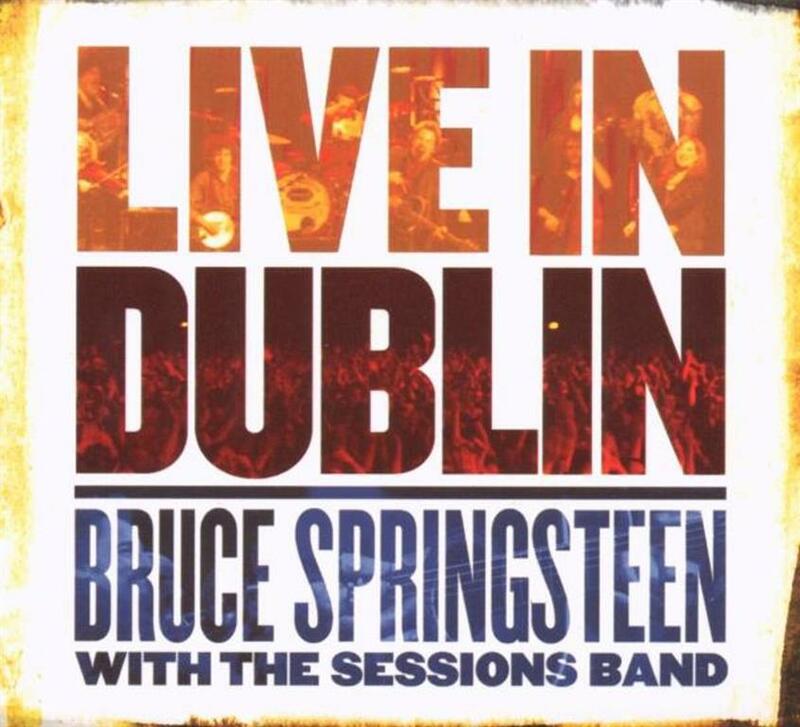 A selection of 23 songs from these three nights was officially released on 05 Jun 2007 on the Live In Dublin album and home video, credited to "Bruce Springsteen With The Sessions Band". "Seeger" was dropped from the band's name for this release, apparently due to the fact that many of the songs are Springsteen originals from his earlier records, or covers that are not related to Pete Seeger. The song was performed in duetting Springsteen / Marc Anthony Thompson. "... this is a song that we, uh, we learned as we went into New Orleans, it was kind of the theme song of the city and, uh, like I said, I´ve been telling folks every night, we play it with some trepidation, uh….and, but there´s a few verses that I, that I discovered in, in a, a book that I had, that I hadn´t heard sung very often, really kind of opened this song up for me and actually the Weavers sing it on their version but there was a (some people cheer) yes, we got some Weavers´ fans….but, uh….this kind of, I guess those verses really kind of explain, uh, what we´re trying to do up here tonight and, uh, so I wanna send this one out to you saying thanks, God bless for coming out, thank you very kindly…." "When the Saints Go Marching In", often referred to as "The Saints", is a Black spiritual. Though it originated as a Christian hymn, it is often played by jazz bands. This song was famously recorded on May 13, 1938, by Louis Armstrong and his orchestra. The song is sometimes confused with a similarly titled composition "When the Saints Are Marching In" from 1896 by Katharine Purvis (lyrics) and James Milton Black (music). The origins of this song are unclear. It apparently evolved in the early 1900s from a number of similarly titled gospel songs, including "When the Saints Are Marching In" (1896) and "When the Saints March In for Crowning" (1908). The first known recorded version was in 1923 by the Paramount Jubilee Singers on Paramount 12073. 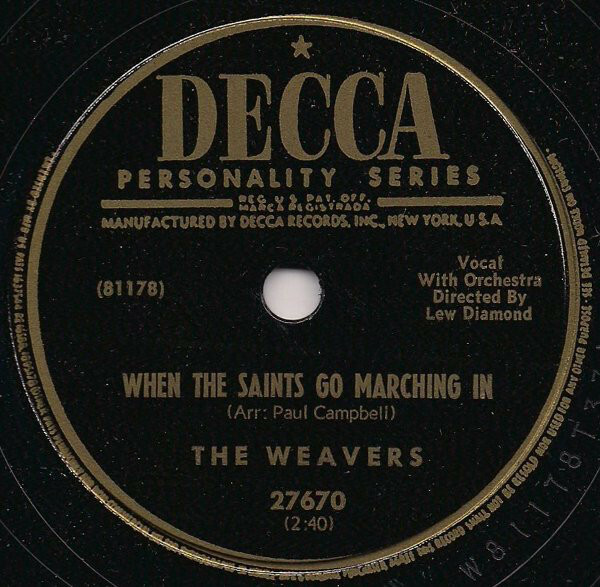 Although the title given on the label is "When All the Saints Come Marching In", the group sings the modern lyrics beginning with "When the saints go marching in". No author is shown on the label. Several other gospel versions were recorded in the 1920s, with slightly varying titles but using the same lyrics, including versions by The Four Harmony Kings (1924), Elkins-Payne Jubilee Singers (1924), Wheat Street Female Quartet (1925), Bo Weavil Jackson (1926), Deaconess Alexander (1926), Rev. E. D. Campbell (1927), Robert Hicks (AKA Barbecue Bob, 1927), Blind Willie Davis (1928), and the Pace Jubilee Singers (1928. The earliest versions were slow and stately, but as time passed the recordings became more rhythmic, including a distinctly uptempo version by the Sanctified Singers on British Parlophone in 1931. Even though the song had folk roots, a number of composers claimed copyright in it in later years, including Luther G. Presley and Virgil Oliver Stamps, R. E. Winsett, and Frank and Jim McCravy. Although the song is still heard as a slow spiritual number, since the mid-20th century it has been more commonly performed as a "hot" number. The tune is particularly associated with the city of New Orleans. A jazz standard, it has been recorded by a great many jazz and pop artists. Both vocal and instrumental renditions of the song abound. Louis Armstrong was one of the first to make the tune into a nationally known pop melody in the late 1930s. Armstrong wrote that his sister told him she thought the secular performance style of the traditional church tune was inappropriate and irreligious. Armstrong was in a New Orleans tradition of turning church numbers into brass band and dance. The Weavers were formed in November 1948 by Ronnie Gilbert, Lee Hays, Fred Hellerman, and Pete Seeger. In 1940 and 1941, Hays and Seeger had co-founded a previous group, the Almanac Singers, which had promoted peace and isolationism during the Second World War, working with the American Peace Mobilization. It featured many songs opposing entry into the war by the U.S. In June 1941, the same month Germany invaded the Soviet Union, the APC changed its name to the American People's Committee and altered its focus to supporting U.S. entry into the war. The Almanacs supported the change and produced many pro-war songs urging the U.S. to fight on the side of the Allies. The group disbanded after the U.S. entered the war.